In a press release on Thursday, The Hungarian Government Debt Management Agency (ÁKK) announced that the government will stop accepting requests for Residency Bonds on March 31st of this year. The Residency Bond system is a program that allows wealthy foreigners to essentially purchase a permit of permanent residency from the government in exchange for a deposit of 300,000 euros, which is later returned to the new Hungarian resident. While applications submitted before that date will still be processed, no new applications for residency bonds will be accepted after the end of March 2017. But although the government will no longer accept new applications, the program itself remains on the books, as the National Assembly has not voted to nullify the law authorizing the Residency Bond system. On a practical level, then, the Program has been indefinitely suspended, rather than legally ended. 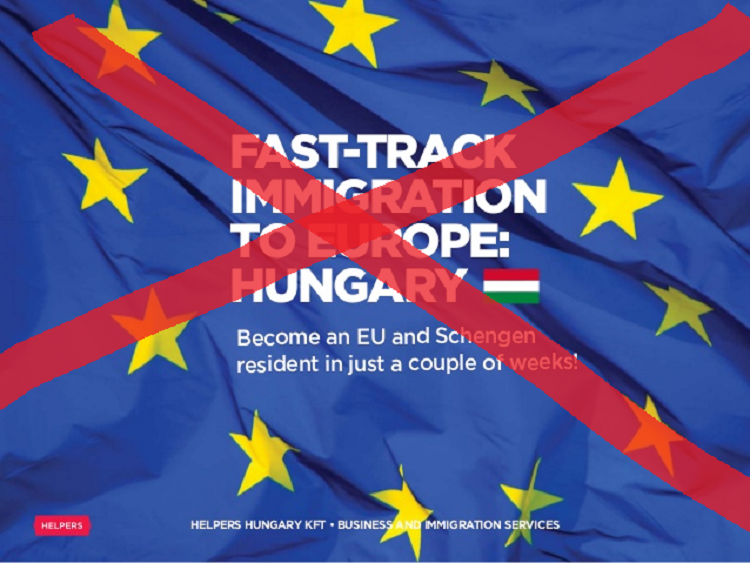 Jobbik continued this theme into November, and demanded that Mr. Orbán include language banning Residency Bonds into his proposed constitutional amendment that would have prohibited quotas for the settlement of refugees. 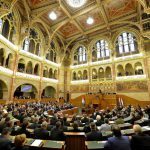 Fidesz and Mr. Orbán refused to assent to what they described as “blackmail” on the part of Jobbik, and in response the far-right party’s MPs abstained from voting, leaving the Prime Minister’s amendment short of the two-thirds majority it needed to pass. In addition, while the government repeated over the course of 2016 that they would end the Residency bond program, they were slow in taking any steps to actually do so. 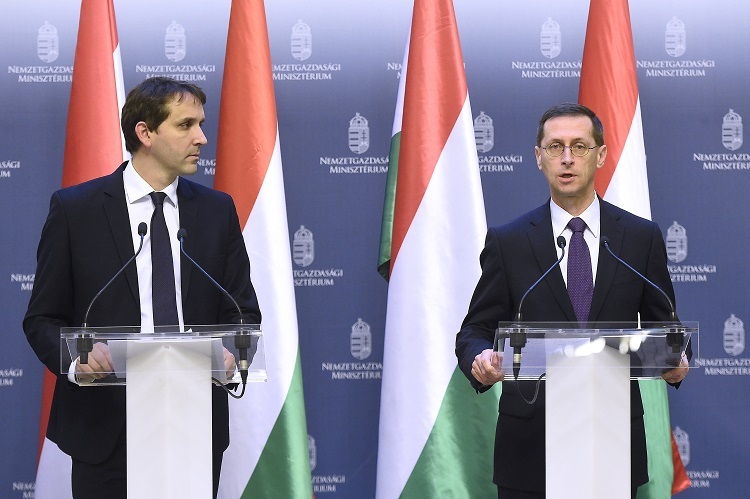 National Economics Minister Mihály Varga (R) and György Barcza, director of the Hungarian Government Debt Management Agency (ÁKK) at a press conference on 28. December 2016 (Photo: Tamás Kovács- MTI). Officially, the government claims that the reason that they are ending the Residency Bond Program is that, since Hungary’s credit rating has been upgraded by ratings agency Moody’s, the country no longer has an economic need for the program. Despite this claim, however, the fact is that the program has not actually brought economic benefit to Hungary, since the interest paid by the government on the bonds is actually higher than market rates. And these interest rates, together with the way in which the bonds are administered, have helped turn the Residency Bond program into a source of political conflict and controversy. Because private individuals cannot apply for a residency bond on their own; rather, the application must be processed through one of one of five companies that have been approved by the Hungarian Parliament’s Finance Committee; four of these companies are based in countries that are popular as off-shore tax havens such as the Cayman Islands and Cyprus, and thus it is next to impossible to know who exactly runs these firms. In addition, the interest earned on the Residency Bonds does not go to the individual who paid for the bond, but rather to the company that processed it. In addition, these companies tend to charge service fees ranging from 45-60,000 euros. As a result of this, as of November 2016, these companies, which have processed 4033 applications, have made more than 110 billion forint (roughly 355 million euros) off the bond program. Since the companies keep both their service fee and the interest earned on the bond, these companies make around 90,000 euros on each bond they process. It is most likely, then, that the government has chosen to end the program due to an outbreak of corruption scandals surrounding the program. For example, in September it was discovered that the government was advertising the bond program to “middle and upper class” Africans (read our article here). Likewise, in China companies have been advertising the bonds at half-cost (150,000 euros), in exchange for which the company keeps the entire 300,000 at the bond’s expiration. And in addition, there have been reports of the Residency Bond program being used by foreign criminals seeking residency in Hungary, as in the case of one Russian citizen who, despite his tax-fraud conviction in Russia, was able to gain a Residency Bond. This was due to the fact that his “official” residence was in St. Kitts and Nevis, and a loophole in the bond program allowed him to submit proof of no prior crimes in the Caribbean tax-haven, which conveniently omitted his conviction in Russia. In all likelihood, the first 3 months will see a large increase in the number of residency bond applications now that the end date of the program has been announced; this can be gleaned from a similar phenomenon that occurred last year, when rumors about the program’s upcoming suspension caused a spike in applications in the last few months of 2016.